Jeffrey Schiek, concentrates his practice in criminal defense law and employment law, representing professionals facing employment-related misconduct allegations. Mr. Schiek represents victims of workplace abuse and harassment. Mr. Schiek has helped develop brochures and articles for workshops nationwide on the topics of criminal law and procedure diversity in education, the community and the workplace, and on the topics of the prevention of workplace violence and harassment. Mr. Schiek has lectured and written on topics for CLE’s (Continuing Legal Education).Mr. Schiek was hired by Philip G. Villaume and Associates in 1999 as a law clerk. 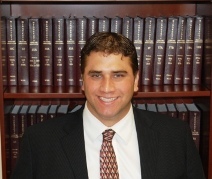 In 2000, Mr. Schiek was hired as an attorney and is currently a Partner. Since 2000 Mr. Schiek has been providing legal services to professionals and organizations. Mr. Schiek represents professionals accused of employment-related misconduct. Mr. Schiek also provides pro bono legal advice to the Amish community in Minnesota. Mr. Schiek has written and argued numerous cases to the Court of Appeals and to the Supreme Court of Minnesota. Jeff was voted Top 100 Criminal Defense Lawyers in Minnesota.